Cliffe Packaging offers a wide range of readily available bulk packaging products for a multitude of applications. As packaging specialists, we provide plain and printed bags, as well as bespoke ones that are made to order at any specification. Take a look at our product range below. If you need help placing an order or choosing the right type of bag, get in touch with one of our friendly sales staff – they’re always happy to help. 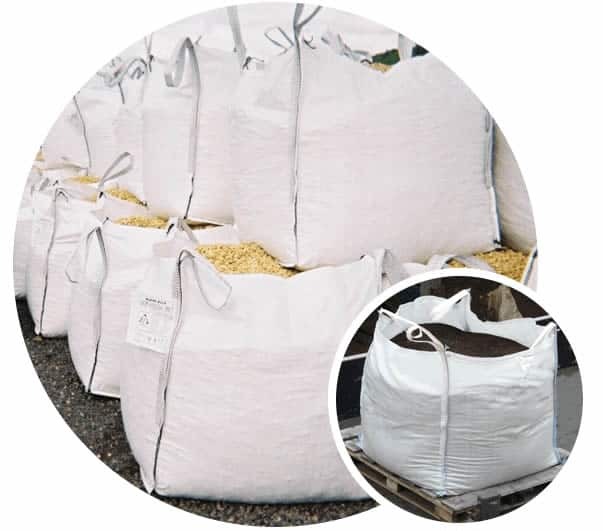 Bulk bags are also known as FIBCs, or flexible intermediate bulk containers, which are industrial containers that are made from a woven polypropene fabric. The nature of this type of fabric gives the bag great flexibility, so it can easily be folded and stored away when not in use. They can generally carry loads of 500kg up to 2,000kg, with a capacity of up to 3 cubic metres. They are ideal for storing and transporting a wide range of materials, including powders, aggregates, plastic granules, pellets and sand. Due to its versatility, this type of bulk packaging is commonly used in various industries, such as plastic recycling and compounding, building and construction, food and animal feeds. All Cliffe Packaging FIBCs can be custom-made – choose the size, dimension and even the mechanisms for controlling how the bags are filled and discharged. Our bags are tested and certified to meet global industry standards, ensuring conformity to the safe working load requirements. FIBCs used for storing and transporting food products are legally required to be certified to Food Grade standards. 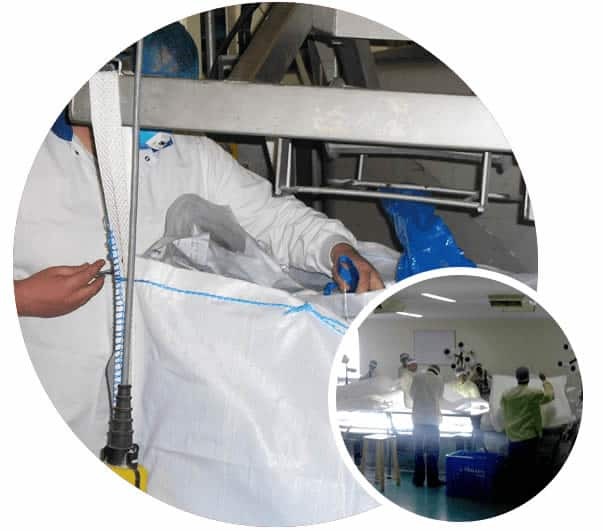 Our food grade bags are produced in a clean room environment with a low risk of contamination. Post-production, these FIBCs are stored in our storage facility that has been accredited by the BRC (British Retail Consortium). All our food grade production facilities are audited and certified by both the BRC and the AIB. Thanks to our innovative techniques, superior machines and qualified personnel, Cliffe Packaging is able to offer premium quality products. When using FIBCs in an electrostatic environment, we strongly recommend the anti-static variety. It is specially designed to protect against charges when filling. 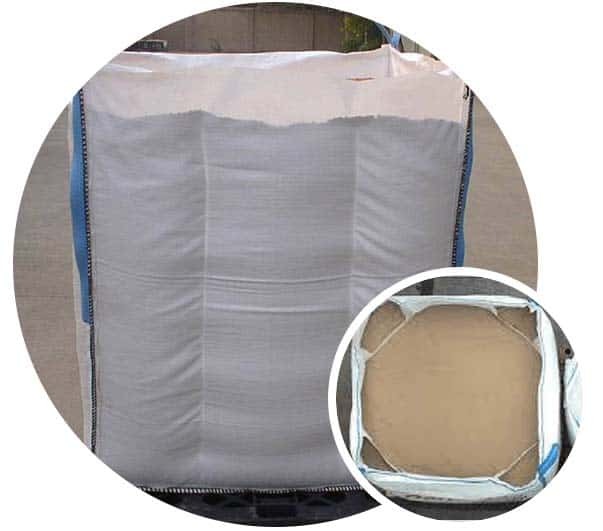 Occasionally, the internal pressure from products stored within standard FIBCs can cause the bags to bulge at the sides, making it a challenge to configure bags on shipping containers. 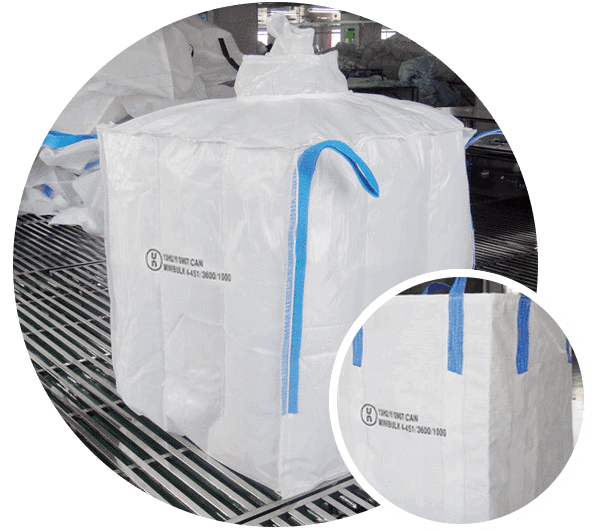 Baffle Bags or Q-Bags are a great solution – these have internal baffles sewn into the bags that keep the form stable once they are filled, allowing premium usage of space and maximum payload for shipping. Builders bags are perfect for storing all types of building materials, such as sand, gravel and aggregate. Depending on how they are used, builders FIBCs are also known by other names – aggregate bags, dumpy bags, gravel bags and sand bags. Need a specific type? Cliffe Packaging can customise bulk packaging to suit any builder’s requirements – you can choose your fabric and to have your brand logo printed on in your corporate colours. If you choose the printed option, our in-house design service is complimentary, with minimum purchase. 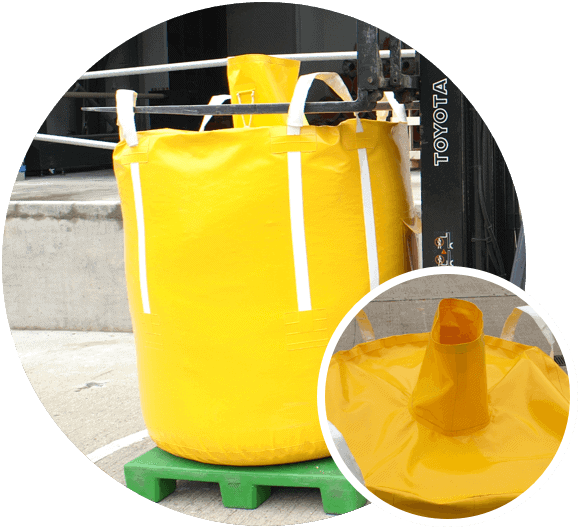 For transporting hazardous goods or materials, ADR UN certified bags are ideal. Specially designed in full compliance with recognised UN standards, this type of FIBC has undergone rigorous testing to confirm its resistance in different situations, such as accidental dropping and stacking stability. 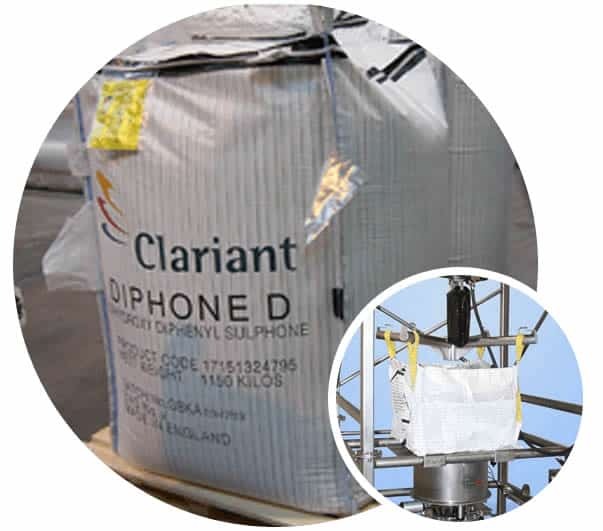 As a trusted bulk packaging specialist, Cliffe Packaging’s ADR UN certified bags are perfect for transporting goods in situations where there is a risk of a fire, environmental damage, or toxic contamination. They come in a range of classifications for use with different substances. 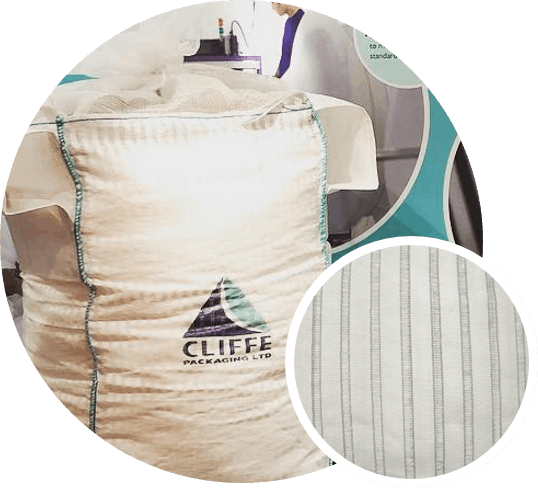 Cliffe Packaging is pleased to present the PVC (SFX) Bulk Bag, a unique product in the world of bulk powder and granular handling. This type of FIBC is manufactured by Structure-flex and made from PVC-coated polyester fabric with all-welded seams, making it completely watertight. In fact, this bag is so watertight that once filled, it can be left outdoors without any detrimental effect to packaging performance. Cliffe Packaging is pleased to present the Ventilated Big Bag. This product is ideal for the temporary storage and transportation of potatoes and other crops which require sustained airflow. Our 26-stripe fabric is manufactured to stringent quality standards to ensure maximum ventilation to your crop, whilst maintaining the strength and durability of a standard bulk bag. See how Cliffe Packaging partnered with Sibelco Europe and improved their supply process through monitoring their bag usage. Cliffe Packaging can provide expert technical help. If you require assistance or advice, our experienced sales team is always on hand to help.